Within the last 24 hours my screen has started to occasionally get a really cool, blue-ish tint every few minutes. It usually lasts for 3-10 seconds. If I quit Flux my screen switches to the blue tint and stays that way until I start Flux again. Version 36.4. Come to think of it I did install some OS X updates yesterday. I'm now running 10.11.1. After updating yesterday to 10.11.2 I'm having the same effect. Screen get a blue-ish tint and after few seconds get is "f.lux" tint again. Two things to try: turning off the Displays Automatic Brightness setting, and try rebooting (with no external monitors connected). We'll call this the "auto brightness bug". 2013 MBA on 10.11.1: yes, flashing when Auto Brightness is enabled, otherwise no. 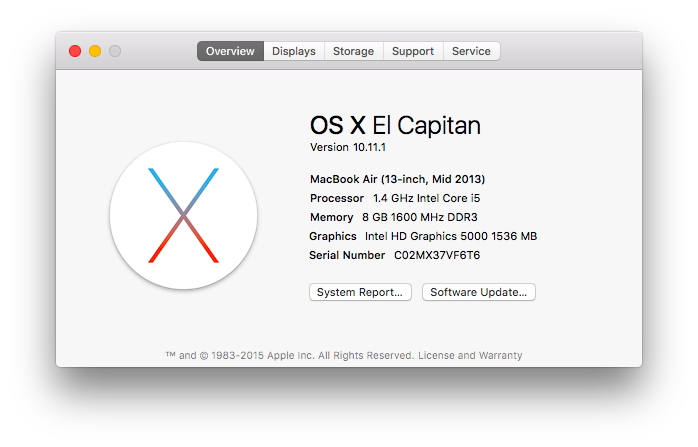 2014 MBPr on 10.11.1: no flashing at all (either video card), whether or not Auto Brightness is enabled. This version is also using a custom profile because it's dual GPU. We see best results after a clean boot with no external devices attached. When we've seen bugs, it has been with external display (Thunderbolt 27) or after a lot of wake/sleeps/etc. Sounds like other people are seeing this more constantly, so any other steps you can think of would help a lot. This is really easy to reproduce by covering the camera (with my hand) at night; the screen will instantly turn blue. Then I can make it red again by hitting the melanopic light refresh button in the about box. Only happens on mid '13 MBA. My mid '15 MBP is not affected. Yes this is related to Apple's new "auto brightness" feature which also adjusts midtones in bright rooms. I've just installed the 36.5 version, and seems that the bug is solved. Since there are two reports of MacBook Pros not being affected, I'll add that my Mid-2014 Retina Macbook Pro running 10.11.1 IS affected. It has integrated graphics only. Yes in the newer betas we are seeing it anytime the Automatic Brightness feature is on (or when it's recently been turned off). I am on the same setup, and with the same problem. It was so annoying I quit flux. But that was even more annoying. 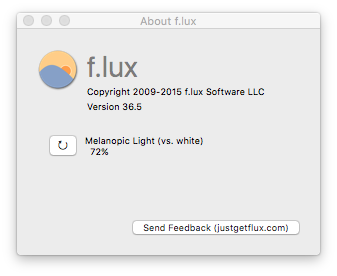 I disabled "Automatically adjust Brightness" in Display prefs and sofar sogood. Is there anything that can cause it to re-enable itself? I could've sworn I'd disabled that, but I looked again and it was enabled. Just disabled it and no flickering (so far). FWIW I'm on a Late 2013 13" MBPr with 10.11.1. @whatismyusername that's frightening! did you reboot? @lorna Sorry, just remembered it was the "Adjust keyboard brightness in low light" setting I had disabled. False alarm. Wow, I didn't even know that was a thing now, ha. Whew.